Aditya's ‘A Garden City Phase V’, in Warje claims to be a trendsetter boasting intrinsic charm of the location and a lifestyle of luxury. Adjoining Kothrud, the project hopes to get a huge community of customers hooked to its ecosystem and to start off here’s what we found out when we visited the site. Kothrud, known Kothrud Baag in the era of the Peshwas, is the western suburb of the city of Pune, Maharashtra in India. Situated relatively near the center of an industrialized city, it has seen rapid growth in housing, making it one of the fastest developing suburbs in Asia in the 80s. Kothrud also saw Pune's first flyover, Savarkar flyover at Paud Phata, which connected Karve Road to Paud Road. Old landmarks in Kothrud include the Dashbhuja temple and the Mrityunjaya temple with the history dating back to the Peshwa times. Kothrud is where Bajirao Peshwa's second wife Mastani used to stay. 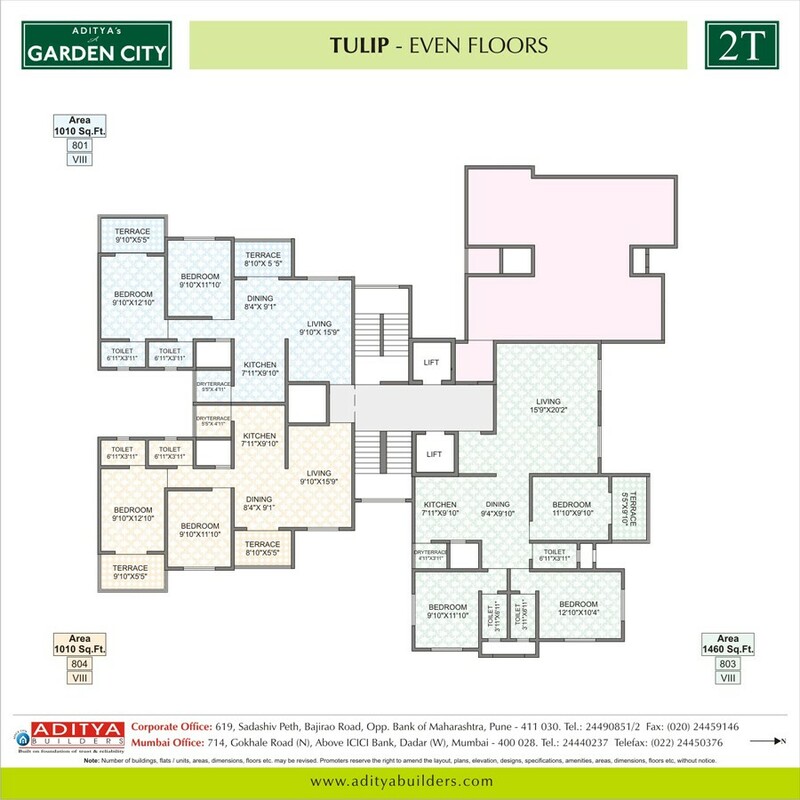 Also, the location possesses the benefits of being near to various known educational institutes, recreation facilities some of these includes National Open School, City International School, MIT, Phoenix Market City Mall, Inorbit Mall to count a few. That’s where the location advantage ends. Located on the wrong side of the city for me, it was the most important suburb in the 80’s and has lost its prominence today in terms of development. 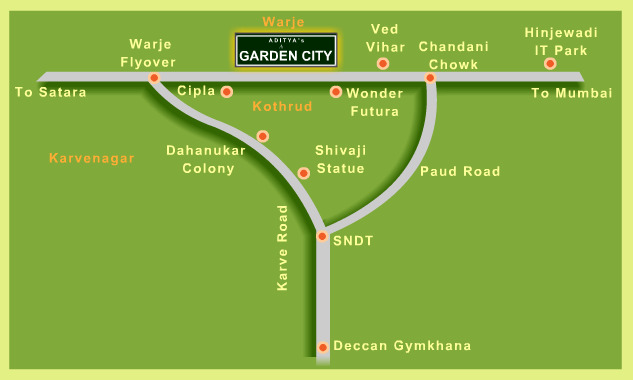 The Wakad – Baner belt offers better investment options. As on date, you are heavily dependent for all recreational activities. It’s a project for investors, only if you have money to lock in for a period of time such a location should be considered. Coming specifically close to the project location. There is a SRA planned next to the project. So overall it's disappointing. PMC decided to use Aditya Garden City as a "pattern" for their SRA program. We are not very impressed here a 2 BHK with a 10*12 master bed and a living space of 16*10 is small. We would have preferred more spacious homes here. The apartment comes with water resistant doors, vitrified tiles, POP ceiling with lights, POP ceiling with decorative lights internal walls with gypsum plaster a designer nameplate, a Stainless steel sink with drain board, and a counter basin in the master bathroom to name a few amenities. Amenities are pretty hygiene. Could the developer have done better, the answer is: Yes! 1. The flat layouts, they are cramped a little for our comfort. A 100 to 120 sqft. bedroom just doesn't do justice to a Pune apartment. - The club house, swimming pool, gym, tennis court and all other facilities that were promised have been locked for the last 7 years by the builder. He has clearly said that he won't allow them to use it. - An open space that was promised to us when we bought the flats has been converted into 2 huge buildings blocking all the light and ventilation. It looks like that the builder is not delivering on promises. Customers are shown a glittery imagery, but you won’t get a smooth and easy to live in experience here by the looks of it. Relying on the past track records of the developer that whoever has taken flat in any project from this builder they all have faced same problems and some even had filed legal cases against them. Investing here won’t be a smart option at a cost of the ease and comfort you look forward in this hectic life.